This is an awesome toy for so many reasons! It’s sort of like a dark room tent for kids. It pops out easily and is ready to go. You get a special light wand that allows you to draw inside of it with only light! The pictures stay up for a while, then you get to start over. The tent itself is really neat, pitch black inside of there (I even fit in it to try it out) so just that is a neat experience. There are air holes on the sides for safety in case you spend hours in it I guess – which can easily happen with this toy! If your kid is a bit afraid of the dark, they don’t have to close the flap all the way either, which is a great option. My daughter loves to go in it and design all kinds of neat things in there. My husband fits about halfway in with her, so they come up with all kinds of silly things. 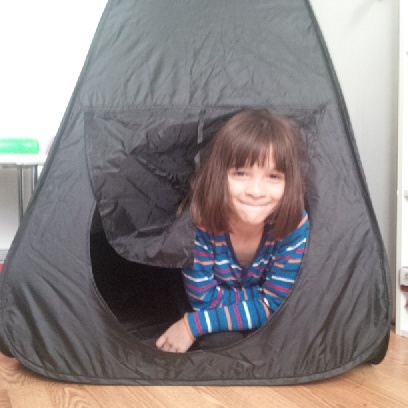 The tent is big enough for two 7 year olds to hang out in, but it’s not too big so you can set it up anywhere. I love that it’s super easy to put away, it comes with a carrying case and it’s really small when folded up. We pop it in the closet, and she takes it out and sets it up when she wants to do some crazy drawing. This is a great toy for kids who want to have their own little hiding spot, my daughter even goes in there with her book lamp and reads!! Great for all ages too – they can draw on the doodle part, or just hang out in there being silly. I really like that it’s just light, no messy glow in the dark paints or powders. A fun idea to bring along when visiting on the holidays, it’s small so won’t be in anyone’s way, but so fun for the kids to have their own place. A really fun idea for a birthday or xmas gift – my daughter really likes hers. It’s recommended for 5 and up, but with supervision (parents can fit in with a smaller kid for sure) I’d say this is fun for any age! It’s really reasonably priced too, you can get the Doodle Dome at Sears or Canadian Tire for around $30.